When the first unpaid mobile applications (non-bitcoin) were released for smartphones in the late 2000’s many consumers were equally as dumbfounded. How will these developers pay for their costs let alone make a profit? In the era of multi-billion dollar mobile acquisitions (WhatsApp: $19 billion, Instagram: $1 billion) it has become clear that the value of any application is access to the user-base and their information. In many ways the era of bitcoin related services is not much different. When considering centralized startups in the bitcoin industry one thing is clear – it is a race for the user-base where quarterly earnings are not of any concern for the time-being. As exposure and adoption grows it is not hard to imagine an increasingly competitive landscape where free may not be cheap enough. 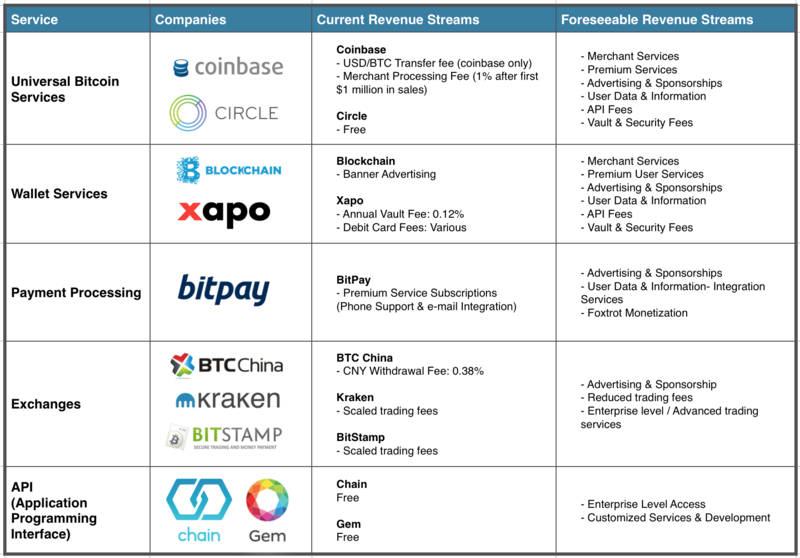 To help understand the “state of monetization” for these organizations I’ve provided a table below (click to enlarge) to summarize the current and speculative methods of monetization. It should be recognized that many of these service providers are in direct competition that could lead to a battle of attrition or a windfall of mergers and acquisitions. Additionally, I would encourage viewers to please leave comments and help build this table as you view. A summary of major bitcoin startups. For each the existing revenue streams have been defined as well as speculations on potential future methods of monetization.